What If the “M” in MOOC Meant Minimal? 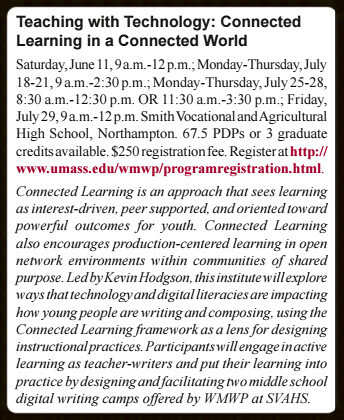 Those of us who have been part of the Making Learning Connected MOOC for the past three summers (and beyond) have been fortunate indeed. The National Writing Project not only conceived and launched the CLMOOC with help of a grant program through the MacArthur Foundation; NWP also funded the work behind the scenes, from stipends for facilitators (I was one) to the technological infrastructure. We all knew the NWP funding would not last, and so it has come to be, it seems. It’s OK, too. NWP and Educator Innovator have a whole lot of cool projects underway for the summer of 2016, including Letters to the President. But the CLMOOC is not one of them. While the support of NWP and all of the folks there over the three years has been critical — with extra huge props to Christina Cantrill and Paul Oh and other key current and former NWP players for making it happen — what if we, the denizens of the CLMOOC, took over CLMOOC and made it happen ourselves? NWP has done its part – seeding an idea. Now it’s our turn to nurture the seed. 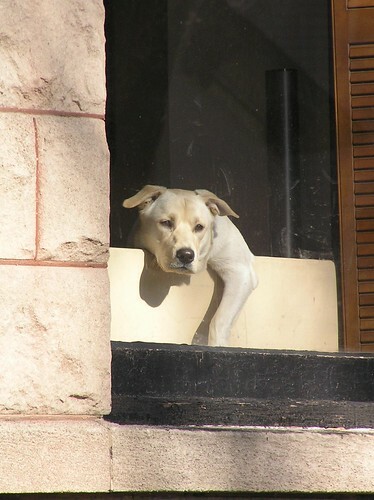 The coming summer, and the status of CLMOOC, was the center of an informal hangout discussion I was having with Joe Dillon and Terry Elliott the other morning as we bounced around how we might get the CLMOOC up and running for Year Four on our own, with little or no NWP support. Well, not “our” own, meaning the three of us. I mean “OUR” own — meaning you, too. All of us. Together. Isn’t that the real dream of the connectivist MOOC ideal? That the people in the learning will run the show and not just participate in what the Oz the Great and Powerful behind the screen says should happen. Granted, turning the keys over to all of us (or in this case, sneaking in through the window at midnight to host a party in the CLMOOC house) potentially makes things messy, and a bit complicated. But it’s our house, after all. We all built it. And you know what? It doesn’t have to be Massive, as in Massive Open Online Collaboration. 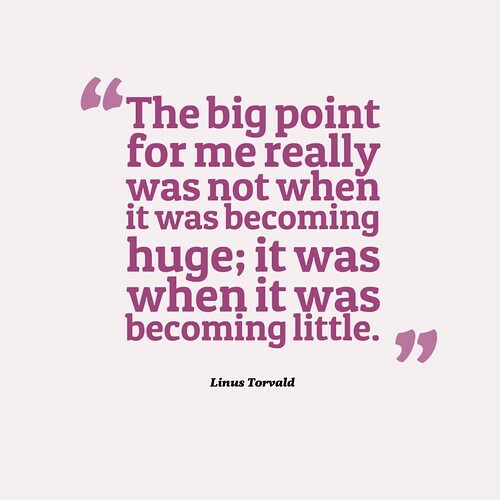 Maybe the M in MOOC can also mean “Minimal,” as Linus Torvald’s quote above (shared by Terry in a blog post) notes. What happens when connections get stronger because they are tighter and smaller as opposed to disparate because they are larger? What if we invite the inversion of scale? Don’t get me wrong. Being part of activities with lots of people has its appeal. You get a sense of the nodes of the world. You feel less isolated in your interests. You feel part of a movement, or something. It’s all part of the Connected Learning theory that the CLMOOC is built upon. However, you can also get lost in the shuffle when the scale is large and massive. Your voice gets lost at times. But if “Small is the New Large” (that might be a cool meme activity, right? ), we might all benefit from tighter connections. We might be more apt to ask more questions of each other or to dig into inquiry together. We might come to know each other a bit better. Our learning would be more than a summer project. It would be part of our professional life. So, we’re going to try to plant some seeds this spring for an “unofficial” CLMOOC summer, and we hope you might come along with us. We have no idea how it will go. You can help make it happen, if you want. PS — Thank you, NWP, for setting this all in motion to begin with! I know what you are going to think: Don’t you have other things you can be doing? 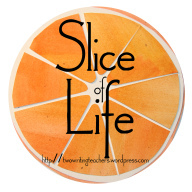 But I was fascinated by the sheer amount of information and data that was in an opening survey for this month’s Slice of Life challenge with Two Writing Teachers. I had used the results of the shared survey to look at the imbalance of men versus women writers the other day but then I noticed a whole section where we who took the survey self-identified our status as teachers. 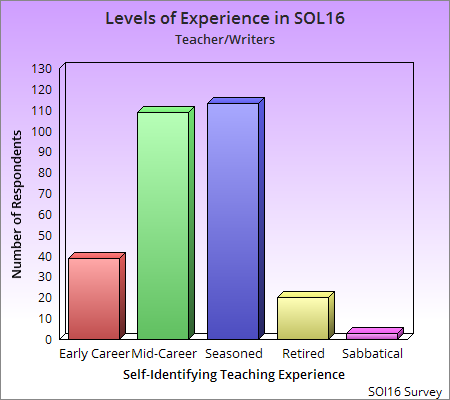 So I counted up the answers from the 300-plus resondents (although a few left that section blank) and then I created a chart to show how so many of us Slicers are well into our teaching career. That’s not a surprise, I guess, but I do wonder how a community like Slice of Life or Two Writing Teachers can best reach out to teachers in the early parts of their career, to encourage them as writers. I’m not putting this on Two Writing Teachers to figure out, but certainly, as a member of the National Writing Project who leads professional development in our area, it’s an issue we have to continue to grapple with. If we want to change the nature of classrooms, and improve access to authentic writing activities that counter the narrative of “standardized testing,” then we need to draw in a wider range of teachers, particularly those educators just starting out. No doubt, many of them are seeking resources and mentors and guidance and suggestions. I know I was, and I know that connecting with the Western Massachusetts Writing Project is what saved my sanity that first year. How can we continue to pay it forward? My friend, Bonnie, is a very talented digital storyteller, and each year, she gathers up images from friends in various online spaces on a theme and weaves them into a digital story. The theme for 2015 was JOY, which was a wonderful counterweight to some of the things that Bonnie was going through in 2015. She lost someone very close. I hope that by weaving together images of joy, she found some, too. My contribution was a collage pic of the “band” that recorded the song that kicks off the video, as people from around the world used an online site called Soundtrap to record my song, All Join Hands. I was in a PLC (professional learning community in garbled edu-speak) last year with a cohort of reading specialists. Although I teach reading, I am a classroom teacher, not a reading specialist. I was in that PLC because our district was launching (yet another) math initiative and I am an ELA teacher. I didn’t mind. I learned a lot from hanging out with these interventionist reading teachers. At one point, we started to talk about digital reading skills (ie, reading on the screen and how different it is from reading off the screen), and I brought some of my knowledge and perspective into the mix (citing work that folks have down at the University of Connecticut with Don Leu with online reading comprehension and others). But it was a comment that another teacher brought up that had me thinking a bit beyond what I was expecting. She noted that students in classrooms where teachers use interactive whiteboards see the whiteboard as a sort of “primary text site” for the learning environment. Daily agendas, and messages, and interactive activities … they all spring from the huge digital board hanging in the front of the room. She then noted how many of her students with learning disabilities often have trouble with “fonts” — of the physical act of reading letters in fonts that are unfamiliar to them (vowels, in particular, can be troublesome). To help address this issue, she has been suggesting that classroom teachers regularly change the fonts they use on their whiteboards, to give students a wider range of “reading” the style of letters and to expose them to different design practices of writing. And so, that’s what I have been doing this year, changing the fonts on my whiteboard on a regular basis. 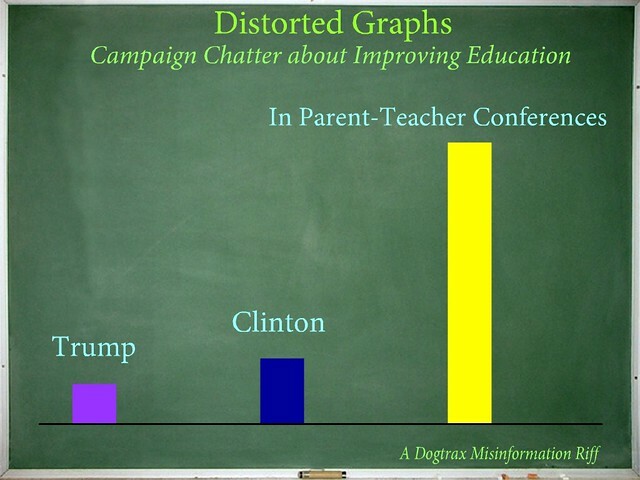 Most of the time, students don’t say a thing. Sometimes, though, they ask about a letter or a font design. 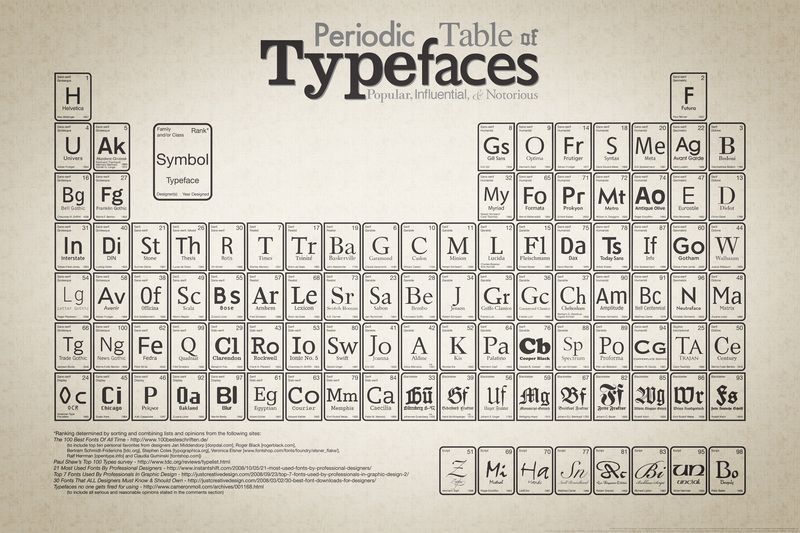 We’ve talked about how some fonts conjure up certain emotional responses from the reader, and how different publishers use different families of fonts. As adults, this kind of “reading” skill gets overlooked, as if design were not important to reading. 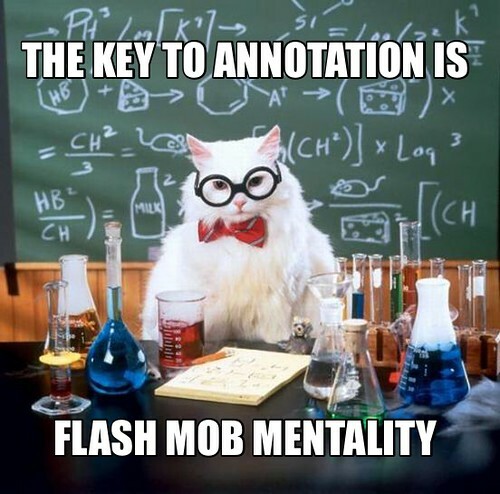 But just like anything, if a reader gets stuck on the screen — if they can’t quite figure out what is being written — then the flow of reading is impacted. By immersing young people into the basics of font design, and by showing them various models of it, we can expand their knowledge. 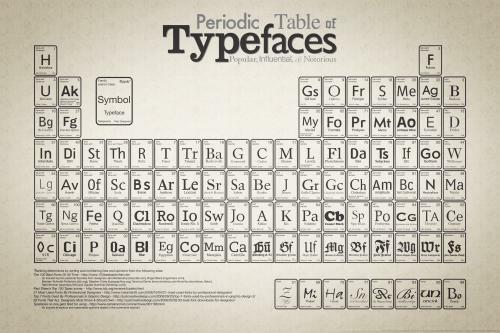 Certainly, my students will spend inordinate amounts of time choosing fonts when they are writing. I often have to say “You have five minutes to find a font and then get writing” or else, time will pass and only a sentence will be written. Yes, it will be a lovely font, but not enough writing to justify it. PS — I once published an entire collection about font, design and writing at the National Writing Project’s Digital Is site. You can view that collection here. 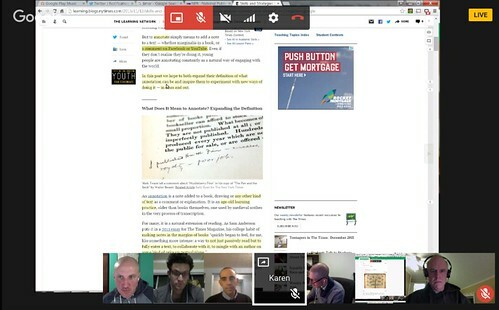 In a recent discussion before the launch of Digital Writing Month, the idea of writing comments in the margins of collaborative documents as an act of shared composition became a topic of conversation for an edition of HybridPod. We were talking Google Docs, in particular, and it occurred to us (Chris Friend, Maha Bali, Sarah Honeychurch and me) that students probably need some explicit teaching of how to write in the margins of documents, particularly shared writing pieces. This is fairly new to the teaching of writing, right? How many of us design a lesson around writing in the margins of books or stories and what that means to write? Mostly, this is because we traditionally all had only one story or one book or one text, and it was ours to write upon, highlight in pretty colors, mark up with Sharpies or crayons or whatever. It’s readability was only dependent on whether the writer could read it and make sense of it. One text. One writer. One reader. Collaborative writing in a digital space turns that on its head a bit. Now, it might be one text, but it might be multiple writers crowding into the margins, and it might be multiple layers of readers — the ones doing the writing, together, and maybe even an outside audience of readers. One text. Many writers. Multiple readers. 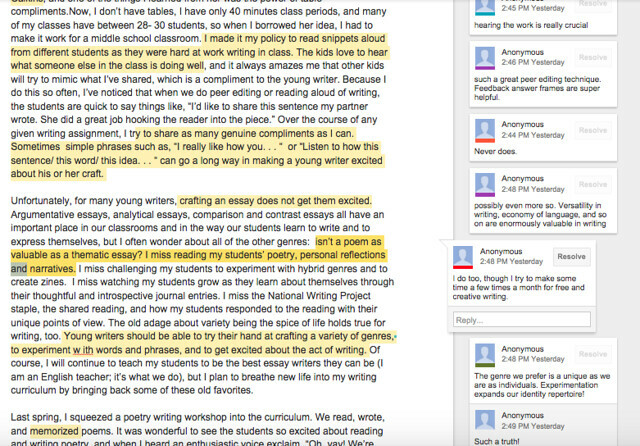 Interestingly, I noticed this idea of “conversations about the writing” unfolding in my own classroom after a lesson on using Google Docs for peer review for short stories. My lesson had each student connecting digitally with another student, but once they knew how to share and get comments, they were sharing and asking for feedback from all sorts of friends … even students who were in our school district but not in our school. I had to quickly give an impromptu lesson about the role of commenting, and the word “resolve” in Google Docs. Actually, that word become an anchor point in the discussion that Chris, Sarah, Maha and I had: what does it mean to “resolve” a comment? And who makes that decision? How do we un-resolve a comment? Does “resolve” mean I agree with you or does it mean I don’t want to see your comment anymore? 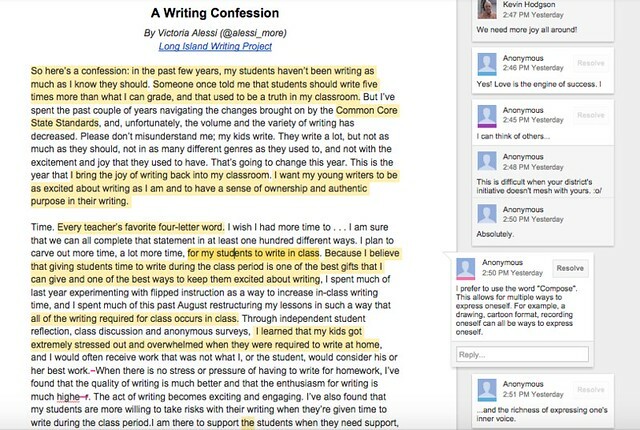 In a recent professional development workshop with the Western Massachusetts Writing Project, I had a group of teachers annotating an article together by Victoria Alessi, to show the power of collaborative writing in a “close reading” activity. I actively encouraged “conversations in the margins” about the text, and told them that I would be sharing the annotated document back to the writer, who is part of the Long Island Writing Project. The results were interesting and fascinating, as this room of educators, who did not really know each other, began to unfold a conversation about teaching writing. In the margins, sharing and understanding were taking place in a room of clicking keys, which then led to a wonderful conversation about teaching and writing and teaching writing. I shared this out on Twitter yesterday, but I wanted to include it here at my blog, too. As part of the National Day on Writing, I had my students reflect on the theme of “why I write” and then we did some class podcasting. I was blown away by the depth of their reflective stance around the act of writing. I don’t know why I am surprised — I know they are strong writers and I know we do a lot around reflective stance — but still … hearing them telling the world about why they write, in their own voice … it’s a beautiful thing.